This article is from Hamish Smith, from The Retro Underground. Ys (pronounced “ease”, not “wise”) the Vanished Omens is a top-down action RPG for the Sega Master System. Published by the now legendary Falcom in 1987 on a number of platforms, it would become the first in a very long running series that continues on to this day (well, in Japan at least). 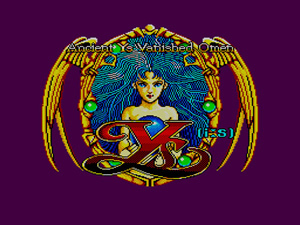 Most fans of the Ys series agree that the Master System version of the Vanished Omens is one of the best and that is the one I have used in this review. In the game, you take on the role of Adol, a wanderer who has found himself in the town of Minea. Adol encounters a mystic named Sara, who tells of a great evil sweeping the land. The only way to stop this evil is by collecting the six books of Ys. So naturally Adol ventures forth to find the six volumes and save the day. It might not sound like much of a story line, but for a game released in the late 80s it was just fine. I have never personally valued graphics over gameplay, but Ys the Vanished Omens looks really good, especially considering its age. The graphics in this game, especially the character portraits in the dialogue screens, really help to give the game a rich atmosphere. The music, while nothing amazing, adds to the overall experience as well. There have been a few remakes released over the years on various systems which update the games graphics and they do look pretty good while managing to keep the overall tone of the original, however the Master System’s 8-bit graphics have a certain kind of charm which can’t really be replicated. What really makes Ys unique is its battle system. At first glance one could be forgiven for thinking it might play like an early Zelda game. 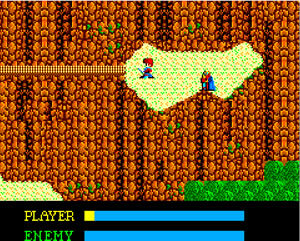 However Adol attacks enemies simply by running into them. I’m not sure if it was intentional, or if it was made that way due to hardware limitations at the time, but the “nudge-to-death” battle system would go on to become a hallmark of the series. There is a little method to the madness, however. The damage you give and take when engaging an enemy depends on the angle at which you ram yourself into them. Hit them head on and you will do a bit of damage but also take a few to the chin. Hit them from behind and you will do even more damage. The best tactic, however, seems to be attacking and enemy from the side, so that only half of Adol’s body is colliding with whatever monster you have decided to pick a fight with. This off center “clipping” approach yields the most damage to the enemy and the least damage to Adol. Any way you look at it, Ys the Vanished Omens is a difficult game, especially at the very start and the very end. You will probably find yourself dying all the time, but that is to be expected. The final boss is absolutely ridiculous in terms of difficulty, while at the start of the game you are almost too weak to kill anything at all. Thankfully though, the difficulty serves as challenge more than a chore. There are weapon and armor upgrades available throughout the game, along with items to help you on your quest. The one major gripe I have is that you can only hold one of each item at once, meaning that once you use an item, you have to go all the way back to town to buy another one. It’s even worse when you find an item you already have in a treasure chest and you have to leave it there. All things considered, Ys the Vanished Omens is a classic. As Adol you will adventure through a land filled with monsters, secrets, colourful characters, abandoned mines, mountain ranges and everything in between. I played this game for the first time a couple of years ago and fell in love with it. I highly recommend this game to anyone who likes old console RPGs and also enjoys a challenge.